Welcome to the first of what I hope will be many tutorials at RectangleWorld! For the inaugural tutorial we will look at a very simple example for beginners: drawing objects to the canvas which can be dragged around with the mouse. We will extend this basic example in subsequent tutorials. Click here or on the screenshot below to see the demo. Here, theCanvas was defined earlier in the code and references a canvas which has been placed in the html page. The line of code above establishes an action to take if any mousedown events occur over the canvas: the function mouseDownListener will be called (the Boolean parameter false means that the mousedown event will not be captured). Note that the mousemove and mouseup event listeners are attached to the whole document window, because if the user drags the mouse outside of the canvas area while holding the mouse button down, we still want mouse actions to have an effect. If you’re coming from a Flash and ActionScript background, you’re accustomed to working with a display list with separate display objects, each of which can have its own mouse event listeners. But in the HTML5 Canvas, there is one display object which essentially works like a big bitmapdata object, and all display objects have to be drawn to this display. Mouse events can only be detected as occuring over the whole display – not on individual objects. So we will have to listen for mouse down events occuring over the whole canvas, then check if the mouse location was over any of the positions where we have drawn an object. Since the objects in this example will be filled in circles, it will be easy to check if the mouse coordinates are over one of our objects by a simple test to see whether the distance from the center is less than the radius of the circle. We will check each circle to see if the mouse coordinates are over that object, and by paying attention to the layering order of the objects we will only move the topmost object. Checking each object for “hit test” with the mouse coordinate position could be very inefficient in a situation where we would have a very long list of objects. In such a situation, we would have to make use of a data structure like a quadtree to pre-sort the objects as they are placed on the canvas, in order to avoid checking all objects for a hit. But with a small number of objects, checking all objects for a hit will work fine. You will notice that in this example when dragging the objects, the layering order is preserved. This is because the objects are always drawn in the same order based on their array order. We might wish to have the currently dragged object appear in front of all the other objects so that we can see it while dragging. We will add some code in our next tutorial to create this effect. Code for the basic setup used here is copied from HTML5 Canvas by Fulton & Fulton. This book is an excellent resource for anyone looking to get started in HTML5 Canvas development. how to get the object coordinate to trigger an action ? Can I save the re arranged circles using a save button? Please reply. Is it possible with other shapes such rectangular,square,triangle,etc.? I’m sorry I overlooked this comment from a while ago! Is it possible that, i am dragging some text and dropping on canvas. When text get dropped on canvas then it get convert to bouncing ball like in above ex.? But does anybody know how the background could be changed to a .png picture? To follow up on my question just above, I find that changing the color number (#FFFFFF or any other color) to transparent allows the circles to change within the canvas whenever you refresh the browser, but then the circles leave their color in their path on the canvas as it is dragged. Can the code be reorganized so that it contains two layers, one definitely place on the screen after the completion of the other? The second layer, consisting of the circles, would need to place the circles without otherwise changing the first layer. Is this possible? I think that the background in the current code seems to be tied to the colors of the circles in some way. 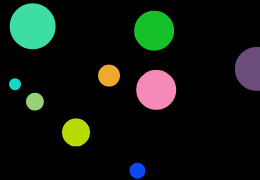 When the color of the background is not specified, it comes out to be a random color, like the circles do. Sorry I never responded. I am not actively updating this blog lately! You can certainly use a transparent background in the canvas, and to clear it out (instead of drawing the background color over it), use the function clearRect(). You can put your image behind this clear canvas using proper CSS to position the image and canvas in the same spot. Use the z-index attribute to make sure the canvas is above the image. Sorry I don’t have time to give more explicit instructions! Hey Dan, Can I have whole code in one file? Hi CK, I’m afraid I don’t have time to put together a file for you, but here’s what you can do: Download the source code here, and delete the Modernizr stuff because it is really no longer needed. Delete lines 44-47 where the canvasSupport() function is defined, and also lines 49-51 where the function is used to check for canvas support. Then everything should work fine without the Modernizr code.